« Vridar Exposed. True Confession. It is unusual nowadays to find a frenzied propaganda composed solely of claims without relation to reality. Some of us may already be thinking of a contemporary example in the White House. Posted on 2018-07-03 23:51:33 GMT+0000 by Neil Godfrey. This entry was posted in Uncategorized and tagged Mass media, Propaganda. Bookmark the permalink. Ellul seems to be saying there has been a fundamental transition in propaganda that occurred in the first half if the 20th century. How does he account for this transformation? Reality is complex and our minds are limited. We use information to form mental models of reality. Discrete facts are inadequate for complex decision making. We wouldn’t make better decisions if we did retain all the information we receive. But that doesn’t mean that verified information is not of use in decision making or that more and more accurate information is not better than less. What is the alternative? 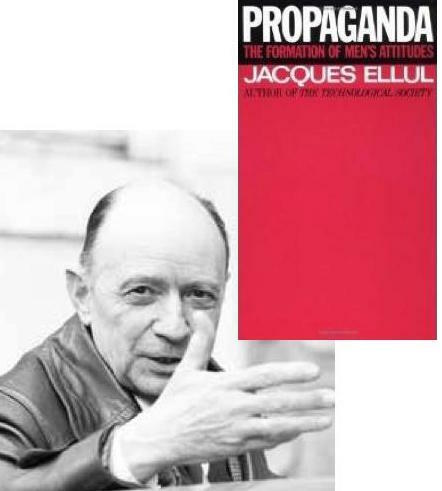 I was introduced to Ellul while studying a post grad educational studies degree and Ellul was essential reading in our exploration of the difference between education and propaganda. As a teacher I saw it as the responsibility of educational systems to teach students to control their own learning, to question not just the content before them but the mechanisms that produced and presented that content to them. In other words, learning not to simply accept what they see and hear as “the news/facts” but to develop critical thinking skills and habits. I don’t recall offhand the details of Ellul’s discussion of the historical details of the change in propaganda, but I do recall other studies showing how (beginning with World War 1 actually) Edward Bernays (Sigmund Freud’s nephew) helped pioneer the “new propaganda” as part of Woodrow Wilson’s propaganda committee. After the war Bernays extended those techniques to the world of business and the “need” to sell the capitalist system against the growing unionist and socialist movements. As a teacher for 40 years, I heartily agree with your first paragraph. But I see the difference between propaganda and information as being not in those qualities of critical and independent thinking, but in whether the facts presented are true. Most communication is propaganda in the sense that it tries to make a case for something. Trumps communication is propaganda rather than information not because he’s pitching an agenda. It’s because he pitches it with lies. It’s not information overload, it’s falsified information. IMHO. Neil, I think I got off on a tangent there. I was not disagreeing with anything you said in your comment. I see “information” as the data or narrative, whether true or false. “Propaganda” I see as a process, an intentional activity that uses information. “Education” also is an intentional activity that uses information but does so with a different intent and with different methods and goals. Ellul said, “The facts, the data, the reasoning—all are forgotten, and only the impression remains. And this is indeed what the propagandist ultimately seeks.” Technically Ellul should have said the propagandist penultimately seeks to instill certain particular impressions. What he or she ultimately seeks is another matter that is seldom confessed. We are left to decide which pundits have the best evidence for their take on the propagandist’s aim. Neil, glad to see Ellul in your article above. It’s been a very long time since I read his “Technological Society,” “Propaganda,” and everything else that appeared in English. I think some of the keys to understanding his theory of propaganda go back to the concepts he developed in the first book: the technological imperative, the dominance of techinque, and all the determinism that says human progress demands we sacrifice liberty and privacy and community in the name of the latest tech we have developed. “Objects manipulating objects” is one of the key phrases I recall from one of the books. Kind of reminds me of Facebook replacing community and human interaction and making us believe we are connected. The way evangelicals have fallen for Trumpism in my country makes me think Ellul was spot on about propaganda. They are as captured as the brown shirts, but it has been done so subtly that they think they are acting very rationally while subverting the supposed gospel message of love and tolerance to truly poisoning heresy. They are up to the steeples in politics and believe a modern Good Samiritan would demand a passport before helping the poor s.o.b in the ditch. No accident I think that Robert Maynard Hutichin’s Center for the Study of Democratic Institutions pushed for the translation and promotion of Ellul in the US. The Center saw what his message meant for the decline of the liberal west in the classical sense. It’s all illusion now, Ellul would say. Ah, you bring back memories. Yes, Ellul’s Technological Society was essential reading but you recall it better than I do. And Hutchins’ The Learning Society also would have beguiled me had I not been reading it alongside a swath of other works with a more “socialist-democratic” focus.